Is it possible to run a satisfying game session in just one or two hours? In this inaugural episode, Andy and Chris share their experiences running game sessions with very tight time constraints. 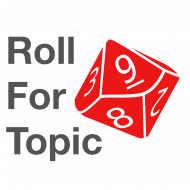 Chris: Hello, and welcome to _Roll for Topic_ an RPG podcast. This is a podcast where we have GMs discussing various topics related to running games. Let’s do some quick introductions. My name is Chris Salzman. Andy: My name is Andy Rau. Chris: We are two GMs, we’ve known each other for a while, but we decided to do this podcast to get a chance to sit down and talk more specifically about one topic relating to, “Hey, you’re the GM. How do you keep this thing going smoothly?” So to that end, we have created a D10 table with a number of topics on it. This is… our hook here is that every time we record, we pull up that table, we’re going to roll a D10, see what comes up, and then we’ll use that as our topic. This helps us to not over prep, which is a good thing when you’re dealing with GMs. Andy: All right, Chris, I’m going to need a D10 roll from you, please. Chris: Ok, all right. Thank you. Chris: Yes, all right. That is a nine. So what’s nine on our table? Andy: All right, let me consult our table here, Chris. Today our topic with the result of nine: we will be discussing how you fit a game into two hours. Chris: Yeah. Okay. Well, I have some thoughts, but why don’t you dive in first. Andy: This has been one of my big goals as a GM over the last couple of years, and that is getting the game experience down to just a couple hours and it’s entirely because of my life circumstances. Like everybody else, I don’t have as much time to game as I did in my youth. But the main thing is I’m playing more and more with kids, with my own kids and their friends, and I have discovered that over a couple of hours, you… the game really goes south with kids under the age of 12 or 13. So my daughter is 11, I play with her a fair amount with her friends. And I have just found that if I’m going over two hours, I start to lose them and they start getting silly and things like that. I have also found this and it’s makes for a much easier pitch for my kind of casual gamer friends who are not super enthused at the… who can’t or aren’t enthused about the idea of taking six hours on their Friday night. Like we used to, we start at 6pm and then people are heading home at like 1:15 in the morning. That’s not really something I can ask from my adult friends with kids and jobs anymore so…. Two hours is maybe a little too short for adults, but I have been trying to keep the games I play with my casual gamer friends somewhere in like the three hour vicinity. Chris: That’s interesting. So you mentioned when you were younger you’d do six-, seven-hour sessions. Chris: So if like that, I guess now I’m just really curious. Like, what was the longest session you ever played? Andy: Oh, I don’t know. The longest session, and I’m reaching way back into the mists of memory that are clouded by nostalgia…. One of the first times I ever played _Dungeons and Dragons_. This is mid ’80s, I was introduced to _Dungeons and Dragons_ by my cousin who I was visiting for the summer. And he broke out this, “Have you heard of this, this thing called _Dungeons and Dragons_?” I had vaguely heard that it was satanic. He had a bunch of modules and I recall starting playing this on like a Friday afternoon and finishing on like a Sunday evening. Obviously we slept in there, but I’m pretty sure we just played D&D. This is unthinkable to me now. I mean, there’s no way I could do this now, but I’m pretty sure we played D&D for like 12 hours a day for three days. I never topped that experience. It was a heck of a jump into the deep end of role-playing, by the way. Chris: I mean, that’s probably for your own health, it’s good that you haven’t done that. Andy: Oh, yes, yes. Occasionally I’ll read about people, adult gamers saying like, “Oh, yeah, my friends that I rented a cabin and we went up and we played for 12 or 16 hours a day.” And that sounds really cool, but I also just don’t see how I could possibly hack that at this point. I have trouble sitting down and doing any one thing for more than an hour and a half or something, even playing a video game I love or something like that. It’s hard for me to do that. Chris: Oh, yeah, I can imagine. A couple months ago, I got together with some friends, and they wanted to… I think a couple of them hadn’t played D&D before, so we ran through kind of a pretty basic scenario, which was fun. I ended up GMing for like, two three- or four-hour sessions in one day. I was just wiped out, I was a little bit sick, anyway. I mean, there’s just…, once you’re past 25, you can’t do that anymore, I think. Chris: The whole concept changes. Andy: And what I found when I am playing in longer games, like at a convention where it’s typical for a game to occupy a four-hour time slot or occasionally even more, is that you do start, somewhere around hour four or hour four-and-a-half, you do start to realize how much of your typical game is this filler that’s not really that fun. Andy: So part of the motivation for getting the game time down is to identify that stuff where nobody’s really having fun doing this. It’s filler content, it’s not really adding anything. See if you can at least tone some of that down, if not strip it out altogether. Chris: Are there are there particular things that you’re thinking about? Andy: So the bane of my games, the thing that frustrates me… I’ve been in groups where shopping ends up being this huge time consuming thing and this is not something I’ve ever really been interested in spending a lot of time in game doing. But obviously other people dig it and if anybody listening to this loves role-playing out there two hours of shopping for swords in _Waterdeep_ or whatever, more power to you. But what usually happens if it’s not shopping… anything where one player has a bug to do something, like they really want to buy a magical spell while they’re here in town. Or, if you’re spending more than 10 or 15 minutes on your one player tangent, it really starts to drag the whole momentum of the whole game down. Andy: Yes, absolutely. A lot of this stuff you can totally, you can handle it via email in between sessions. You can handle it… I mean, if you really do want to role play this out and I can definitely see some… I can definitely think of scenarios where you would want to take a player aside and let them role play out an experience that’s important to their character. Just meet an hour before the game and run through that with them, or have lunch with them during the week or something like that. Chris: Yeah, that’s interesting. Are there other filler things that you’ve noticed that when you cut them out the game doesn’t really lose anything? Andy: So the other big momentum killer for games that I’ve run and have been in is planning. I *love* listening and giving players the opportunity to plan how they’re going to tackle a challenge. So, just to come up with something like they need to sneak into a castle that’s heavily guarded and has various obstacles they’ll have to take into account in getting into the castle. I love, love, love hearing players plan how they’re going to do it. It’s super fun and it usually… and it’s also really beneficial as a GM to hear what they’re thinking of and planning. It often gives me ideas and how to run the encounter. Chris: Oh, totally. Yeah, there’s *absolutely* a pack of goblins there. Sure. Chris: When do you… so say you’re trying to hit that two hours, and you have a group that is just arguing about like, well, “should we go into the west door or the east door?” And you’re like, “they’re both the same door.” When you have that, are there any things that you do to speed them up? Andy: Oh, so I wish I had, I wish I had an arsenal of good ways to kind of — in the spirit of the game — get players moving. Andy: Yeah there’s… that is a… well, I’ll hold that thought and get onto it, but I wanted to say, yeah, there’s some certainly unsettled but probably better ways to put a little pressure on people to wrap up the planning, and that is just to remind them that “hey, the hour’s getting late…” or, you hear sirens in the distance or,… come up with some way to remind them. And players being pretty cool, will, probably understand what you’re doing, right? Chris: That’s, yeah, that’s actually a really good way to do it. So another thing that I’ve done, which I’m not exactly proud of, but is sometimes effective is just hold up my hand and start counting down from five. Chris: And then, when you get down to zero, then roll it on a wandering monster table, something like that. Andy: That’s scary. That’s intimidating. Chris: Or it’s just a bluff. Chris: I hope none of my players are listening to this. But yeah, I mean, just straight up bluff. But, the thing is, you’re right, the people are just kind of going back and forth on something that doesn’t exactly matter. And that can be fun, but if you’re reading the table, and you’re realizing it’s just two players and the other three are sitting there bored out of their minds, it’s not good. Andy: Something you mentioned called to mind another way that filler time ends up taking up space in your game. I didn’t realize until I started having this increased pressure to keep games to a reasonable length, how long typical combats drag on beyond the point where there’s any question about the outcome. Andy: This is probably true of a lot of action scenes and encounters in general, but it’s pretty obvious in combat. There’s usually a point in any combat where it’s really obvious that the PCs are going to win. They’re over that hump, that initial period… they’re over that initial period of threat and maybe they’ve taken out the boss and they’re cleaning up the goblin guards or whatever. That’s not usually very exciting to play out, there’s no tension in the combat, why are we even doing it? I think you have to be careful with this, because it introduces a kind of a meta game aspect that can kill some immersion if you do it too carelessly. But I have started being a little bit quicker to say, “all right…, you guys round up the remaining bandits, and we’re done with the combat,” trying to move that along once it becomes painfully obvious what’s going to happen. Do you run into that situation? Chris: Eventually they got to a wall and I just said, “Okay, everybody roll your attack at the same time,” essentially. And then they did that and then obviously they all hit. Chris: So combat was done, but I did allow them to still have that roll just in case it would have mattered, just in case they all rolled ones or something like that. So that was one thing I experimented with. Once you get to that point where everybody’s surrounding the last enemy like that, just go ahead and have them all roll at the same time and see what happens, rather than roll, wait… next person goes. Andy: That’s a good idea. Yeah, once you reach that point you can stop this artificial turn by turn structure and just let everybody roll. Chris: Yeah, especially when the boss is not intelligent in any way. So, if they’re fighting a gigantic skeleton, you’re not going to sit there and reason with it at some point when it gets down low on its HP… you can just jump to the conclusion. I think that’s okay. Chris: The way that I run into this two hour limit is, I run a weekly lunchtime game, so at 1pm on Fridays we get together and play for an hour. Andy: An hour. That’s pretty tight, that’s really tight. Chris: It’s *very* tight. The way that I describe it is that it ends up being sort of like a TV show at that point, so you very quickly get to some sort of conflict, you resolve it, and then set a cliffhanger for the next session, next episode whatever you want to call it. But since you’re doing that you really don’t have time to spend a bunch of time debating about what your plan is. Because combat… because the session might be a single combat between the party and an enemy, and they might take 10 minutes to decide how they’re going to do it, and then it takes 40 minutes to do the actual combat, and then you have 10 minutes of wrap up. And, too, since it’s on a Friday during the work day, most of them are… some people are actually bringing their lunch with them. You’ll see you have some of that other stuff going on at the table, too. I’d say, though, it’s really fun, and from a GM’s perspective it does train you and teach you how to look for those cliffhangers and those story beats that are just a little bit more interesting than, “Okay, well, you enter the next room, you go to the next room, you go to the next room,” because you want things to have some sort of natural interest. I don’t do it right every time, but I’m getting kind of better at it. I’ve been doing this for about a year. Andy: Yeah. You know, that makes me think that it’s something that you don’t really read. I don’t really remember reading in the _Dungeon Master’s Guide_ and stuff is this element of pacing. I don’t think most D&D, generally speaking, I don’t think people talk about D&D games in terms of pacing out the time you’re playing. I don’t remember reading about this in the DMG or elsewhere, but you really have to think about that when — you would *really* have to think about that with a one hour lunch session. If you have a… if you just had a dud of a session, everyone just… it’s an unsatisfying experience. That’s just kind of a waste of time that’s going to really drag your campaign down. Chris: Oh yeah. Yeah, I’ve definitely had some duds of sessions, too. It was like, well, “is anyone going to come back next week?” I hope they had fun, yeah. Andy: How do you, besides just practicing, get used to it? How do you… you can’t naturally have a cliffhanger once every hour in a game without putting some real effort into it. So, can you describe what a typical hour long session looks like? Have you, do you design the adventures with this one hour thing in mind? Do you keep this in mind while you’re plotting out encounters? Chris: Yeah, keep in mind whenever we’re coming to the table, It’s like “okay, what’s…?” It basically comes down to “what’s the most important thing to happen?” Where are they at, whatever they said as their next intention, then what’s the important thing to happen that can drive the story ahead. And you can make a cliffhanger pretty much out of everything. So if they’ve just finished combat, the next thing that can happen is they enter a room and there’s something that they really want to explore, but we’re done. So they just… again, they’re doing the starter set, which I think is designed a little bit better than some other adventures for doing this style of play. One cliffhanger example that I thought was pretty fun was there’s a spectator in one of the rooms in the way back of a cave. It’s an old, blasted out blacksmithery, so they opened the door… they finally figure out a way to open the door and inside there’s this giant floating green ball with a bunch of eyestalks and stuff. Andy: Yeah. Let’s hear it for the spectator, by the way. That’s, you know, beholders are kind of old hat now. Andy: Spectators! That’s some good stuff right there. Chris: Yeah. It was fun. So we ended there with the description of the room, and there’s this green floating thing that gurgles in your head, “Hello!” or whatever. So for them, the people that that knew D&D were like “oh my goodness, it’s a beholder,” because all they got was a description of the eyestalks and floating green mass and the other people were like, “what is that thing?” So when we hit the table then the next week, they knew exactly what they were dealing with. Chris: …although I know there’s lots of GMs that say “players should never be the one recapping,” but whatever. Andy: Oh, no, I think that’s a great idea. Chris: Yeah, so they do a quick recap, tell me what they think happened. I can correct them, if there’s anything that doesn’t make sense or whatever, and then we just hit the ground running from there. So they’ll, if they’re in a dungeon, they’ll probably get through a couple of rooms. If they’re fighting a big boss, they might just do that boss. Those sorts of things. Chris: I guess what I should say is interesting from a GM perspective, because often if you’re sitting down for a three- or four-hour session, you’re not really sure where it’s going to go. When you have it broken down into one hour chunks you can be reasonably sure what the next couple things are going to do. Andy: Oh, that makes sense. Chris: Yeah, so you can almost split up your GM prep into these discrete blocks as well. Because sitting down, I mean, prepping for a four-hour session, you… you could just spend 30 hours doing that, but if it’s a one-hour session and you know that they’re about to face a spectator, then you’re just going to prep “What does that thing sound like? What can it do?” All those sorts of things. Andy: …if you are coming up on two hours and the players have not made as much progress as you want. I have *never* in my decades of running games ever had an adventure naturally wrap up early, no matter how simple or short I think I’ve written an adventure. It always just takes longer, and you think I would learn by now how to accurately budget time but I haven’t. So it means, for me it means if there are key items or key pieces of knowledge that the players are going to need to have to successfully complete the adventure, you have to get those out pretty early on because you just can’t count on that they’re going to get to the later game content in the time you have. I’m talking about something where it’s kind of important to wrap up the story in one night. If you’re going to be meeting next week and can pick up where you left off this isn’t as big a deal. But in a one shot or convention one shot or something like that…, I try to make sure that the key stuff is available for them pretty early in the adventure, or it’s stuff that I can easily move up if I can see that time is running short. I have definitely blown it and not been able to wrap up a short adventure in the time slot allotted. And it’s a real downer when you aren’t going to be getting together again anytime soon to continue and you had to quit right before the final showdown or something like that. Andy: So you do have to think, is there… just keep in mind “I might have to move, to have this end satisfactorily, I might have to move the final stuff up rapidly.” So is that going to work geographically? Is that going to work in a plot way? So design your adventure so that you can do that. Andy: Yes, I mean if you have to get blatant about it. Some of the cost of doing this is that sometimes you have to drop a little bit of that immersion and just herd people along. I don’t mean in a super restrictive railroading way. But people who are here to play a two hour game also understand that we all need to respect each other’s time. And so if I need to start having the NPCs get a little heavy handed with… then so be it. Chris: Or, “Why haven’t you explored this very obvious path?” But as a player, sometimes you’re not interested in that or otherwise you’ve just overlooked it, or you just don’t have the full picture in your head. So sometimes it’s very easy to miss that. And then, so if you’re playing a four-hour session, it can be very easy for the GM to just sit back like, “well, hour three they’ll pick it up.” But if you only have one or two hours it’s really got to keep moving. Andy: The way this manifests most frequently in my games is basically redesigning dungeons on the fly to chop out extraneous side paths and things like that. So if they were going to have three different corridors they could go down, but time is short, well, I just take out two of them and there’s really only one way for them to go. Or I just make sure that whichever corridor they take just goes to the place they need to get to. That gets tricky though, because, and I’ve run into this recently: a well-designed dungeon won’t be a linear slog towards the end. And I think it’s important to not lose that. I think it’s important not to just impose total linearity on, for instance, a dungeon encounter. But when you have a nonlinear dungeon it means that players could get lucky or smart and figure it out quickly or they could turn left way at the beginning and then find themselves just spending huge amounts of time in this extraneous part of the dungeon that’s cool but isn’t bringing them any closer to the finale. So I don’t know I guess it’s tough. It’s hard, if you design the dungeon too small or too linear people can plow through it too quickly. If you design it too big, you need to be prepared for the risk that they’re going to roam off and you’ll either have to waste a lot of time or you’ll have to redesign it on the fly to channel them where they need to go. Chris: Yeah. I don’t know how good you are at maps and cartography and stuff, but I have a really hard time doing that. When I’m looking at a dungeon that’s already drawn out and then also trying to draw it out for them on the table, I have just the hardest time making adjustments. Andy: Yes. On more than one occasion players have tried to map out a dungeon, so I just kind of freehand sketch dungeons usually on a whiteboard or a battle map as they’re exploring. And I don’t pay too much attention to dimensions and occasionally I have had players who do pay attention to “exactly how wide is this room?” We’ll try to map it, and we’ll quickly find out my dungeon is this non-Euclidean nightmare that couldn’t possibly exist in the real world. Andy: “But wait [doesn’t] the whole audience chamber have to be in between these two things?” and so look it’s, look it’s fantasy come on! Andy: A wizard did it. Chris: We had one session where we were in this very creepy dungeon. But we just kind of jumped to the final part of it, which was honestly the most interesting part of it. It wouldn’t have been all that great had we wandered through a maze slowly. Especially in that system which is just not designed for these small encounters with stuff. But it did make me wonder, if your players like the dungeon exploration part of it, by all means keep going with that. But if what they really like is the big interesting boss encounters, why not just give that to them quicker? Andy: Yeah, that’s a great point! The pressure of time like that, it really makes you think, “what is actually fun?” What is actually fun? Chris: It seems like the conclusion to “how do you fit a game into two hours” is just to strip away anything that isn’t fun for your party. Chris: Which seems like the obvious thing but I think it’s very easy to fall back on “well I’ve got to have a shopping part, I’ve got to have these NPCs do these things, I’ve got to have dungeon exploration and a boss fight” for it to be a full session. But really when it comes down to it I think each session ends up being its own unique thing. Andy: I think that’s a really important point, but I think also that one of the challenges of running shorter games is there is value in some of that downtime, some of that not fun time. You have to be a little careful if you’re just flying from amazing scene to amazing scene. I feel like it might start feeling like when you play the boss rush mode of a video game or something, where, yes, you are skipping to the most awesome and amazing fights, but there’s other stuff in this game, the slower, less awesome stuff that contributed to the whole experience being a satisfactory one. In a short one- or two-hour game session, you might just have to give up some of that slow… that downtime or that slower, not as exciting stuff and just accept that as the cost of doing business. Andy: Well, we can’t have that! Chris: …because people still had fun and that’s kind of the point. Andy: I guess that’s it? Yeah, that’s it. “Did you have fun?” That’s really all that matters. Chris: All right, so we should wrap up. This was actually a really interesting conversation, as always went in different directions than I thought it was going to. Andy: Yeah, I love this not knowing exactly what we’re going to talk about. Andy: And yeah, at the beginning of this conversation, I think, “how could I possibly talk about this for more than about a minute and a half?” and yet here we are. Chris: Okay. Yep. So yet again, you’ve been listening to _Roll for Topic_ an RPG podcast. I’m Chris Salzman. Chris: Have a good day, bye.